OAKLAND — A swearing-in ceremony for Alameda County Superior Court Judge Margaret Fujioka was held on Jan. 11 at the Rotunda in Oakland. 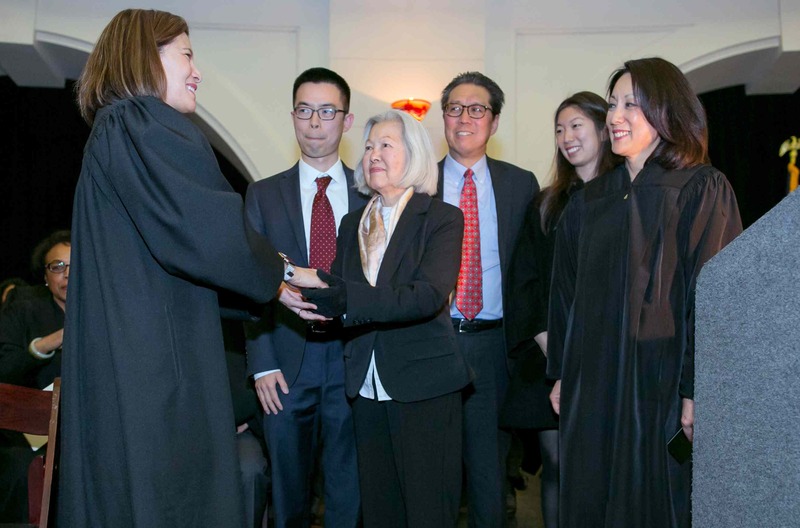 She was sworn in by California Supreme Court Chief Justice Tani Cantil-Sakauye, the first Asian Pacific American and the second woman to serve in that capacity. In addition to Canti-Sakauye, speakers included Oakland Mayor Libby Schaaf, Contra Costa Superior Court Judge Joni Hiramoto, the first APA woman to serve on that bench, and Fujioka’s husband, Cedric Chao, partner and co-head of the International Arbitration Practice at DLA Piper in San Francisco. More than 40 judges from Alameda County Superior Court sat en banc for the induction ceremony. Many other judges attended, including California Supreme Court Associate Justices Ming Chin and Goodwin Liu, Federal District Court judges and magistrates from the Northern District of California bench, and state court judges from Bay Area counties. More than 250 guests attended, including many mayors from Alameda County. Fujioka was also joined by Los Angeles cousins Dale and Grace Kunitomi, Gale, Larry and Andrew Inadomi, and Mary Ellen and Henry Wong. Elected on June 7, 2016 and was officially sworn in on Jan. 3, she currently presides over a criminal trial calendar. She is the first Japanese American woman and second Asian American woman to serve on the 75-plus-member Alameda County Superior Court. Alameda County has 1.6 million residents in 14 cities: Oakland, Piedmont, Berkeley, Albany, Alameda, Emeryville, Fremont, San Leandro, Hayward, Union City, Newark, Pleasanton, Livermore, and Dublin. Prior to her election, Fujioka was an administrative hearing officer for Oakland, Alameda County, and San Francisco from 2010 to 2016. She completed two years as mayor of Piedmont from 2014 to 2016. Born and raised in Los Angeles, she is the daughter of Yoshiro “Babe” and Shizuko Fujioka, and the niece of Private First Class Ted Fujioka, who volunteered from the Heart Mountain concentration camp for the 442 Regimental Combat Team and was killed in action in 1944. Fujioka’s father, paternal grandparents, aunts and uncles were incarcerated at Heart Mountain and her mother and maternal grandparents were held at Manzanar. Fujioka is a former president of the Asian American Bar Association of the Greater Bay Area and the National Asian Pacific American Bar Association. She received her BA from UC Berkeley and JD from UC Hastings College of the Law in San Francisco.